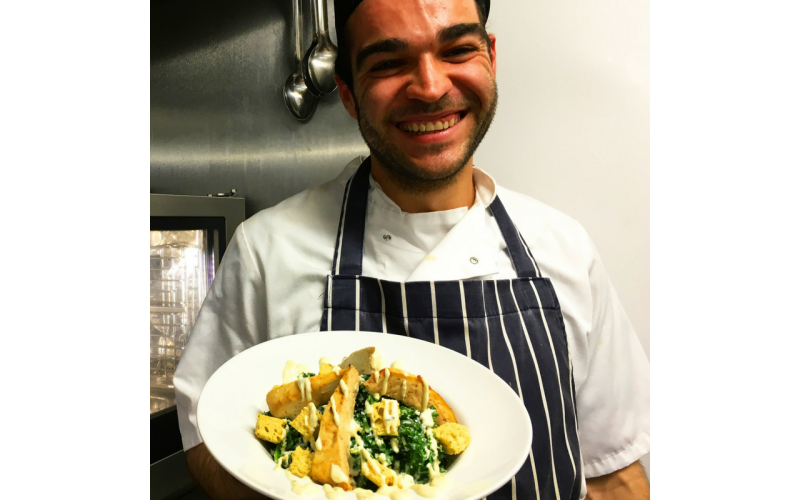 Liverpool restaurant's Our Kitchen presents this highly nutritious Caesar Salad. It is crisp, hearty and packed with flavour whilst delivering a super protein punch. Healthy and insanely tasty! Soak the cashew nuts overnight, drain then rinse. Place into a blender along with the other ingredients, blend on high speed, add more water if required. Destem and place in a large pan of boiling water, simmer for 3 minutes. Heat 2 tablespoons of coconut oil in a frying pan. Cut the tofu into 1 inch thick slices and fry until golden brown then leave to cool. Pre-heat oven to 190ºC/375ºF/Gas Mark 5. Cut the bread into bite size cubes, ½ inch. Mix the bread , oil and garlic powder together in a large bowl, ensure all bread cubes are coated.